Welcome to the Upper Rio FM Society’s website! operators, the community and provide public service communication support in times of emergency. Bob Longoria’s April presentation is now online. Power has been restored to the HUB. All repeaters appear to be working and are link-able EXCEPT the VHF D-Star. ETR is unknown at this time. We will post updates as things change. The Capilla D-Star repeater is off the air for an unknown reason (we think snow / ice related). When the weather allows, the technical team will get to the site and hopefully correct the problem to get it back on the air. 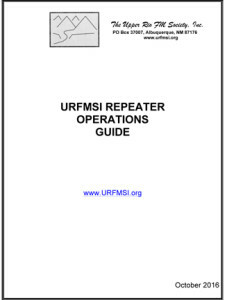 The Upper Rio FM Society started its journey as a club in 1968 with the help of eleven enthusiastic Hams interested in advancing the use of the two-meter band. Today, the organization boasts nine linkable 2-meter and 70-centimeter repeaters (two of which are D-Star digital repeaters). The linking system also has access to over 40 additional 2-meter and 70-centimeter repeaters located around New Mexico that make up the Mega-Link and other affiliated systems. Whether you are a new or experienced Ham, an existing URFMSI member or someone who is interested in joining our organization, we hope that this website is useful. Enjoy, and please don’t hesitate to contact us with your comments or questions! A copy of the presentation at the July 2018 meeting has been posted.